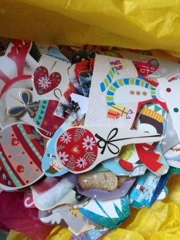 This year we got what seemed like hundreds of cards from nursery and school and they seemed to litter every surface. Always falling down or one of the kids would casually swipe the cupboard top and knock a mass of precariously balanced tiny cards over! I love Christmas but tire quickly of it all once it's over, I like to declutter and look forward to the rest of the year. I like the feeling of space that gets created, my daughter doesn't...getting rid of anything is her idea of 'the worst day ever mummy' (in her own words). 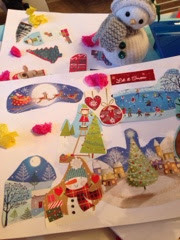 So this year we tried a craft that I remember my mum doing with us, Christmas card collages. It meant I lost the tiresome cards and she didn't feel like she was missing anything - it had just changed into something else. 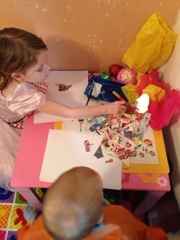 I cut out randomly pictures from the cards and then set the kids up with glue, bits of card and some tissue paper. 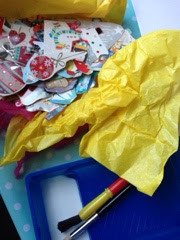 We then had a lovely half hour gluing and sticking. The finished pictures are going to be laminated maybe brought out again next year and stuck on the wall.